Well, I have been busily creating away for lots of different things, but I have managed to do another July challenge. I decided to try my hand at the new colour over at WW1, this was a little challenging, it is a colour called Masala. I decided on these photos of my little brother getting his Land Rover henna tatto, mainly for the red door in the background and that the rest of the photo was fairly neutral in colour. 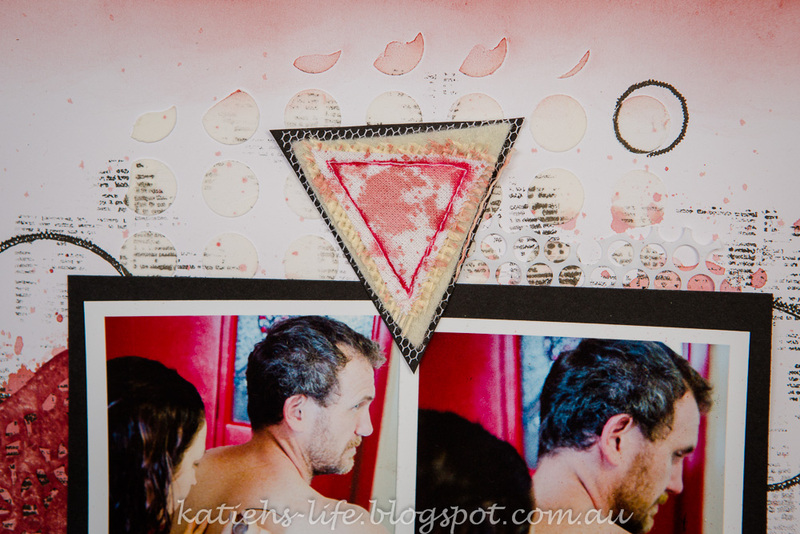 Then I matted in black, I also coloured some Charms Creations DIY triangles (coming soon so keep a look out!) in a grungy kind of way and matted them also with black. There are some circles with stamps and texture paste and a flair button and in the punchinella too. Just a fun to make messy kind of page! I coloured a white doily to match. And I love using touches of black for contrast on these kinds of layouts. Helps things to stand out. Playing with some stamping too. A text background stamp from Kaisercraft and my circles from Indigo Blu! I even found hiding in my stash a label in almost the right colour (an older Studio Calico collection). Anyway, there you have it. It was a tricky colour, but once I found that distress ink match I was all good! Such a fun layout! Love those triangles!! Thank you for playing along with us at White with 1! This looks amazing! Your color is great! Love the background details! Thanks for joining in with White With One this month! awesome layout love the colour match. what a great page! .. and a fun subject to scrap about. Thanks for playing along at White.. with 1 this month :) .. we hope you do so again soon. Wow awesome page. Thanks for joining in with us at WW1. Love this page! Love how you have used the colour! Thanks for joining in at WW1.